When Aries and Gemini fall in love, they connect on a physical as well as an intellectual level. These two Signs love activity and stay optimistic even in the most trying of times. Signs that are two apart in the Zodiac usually enjoy excellent communication and a deep understanding of one another. 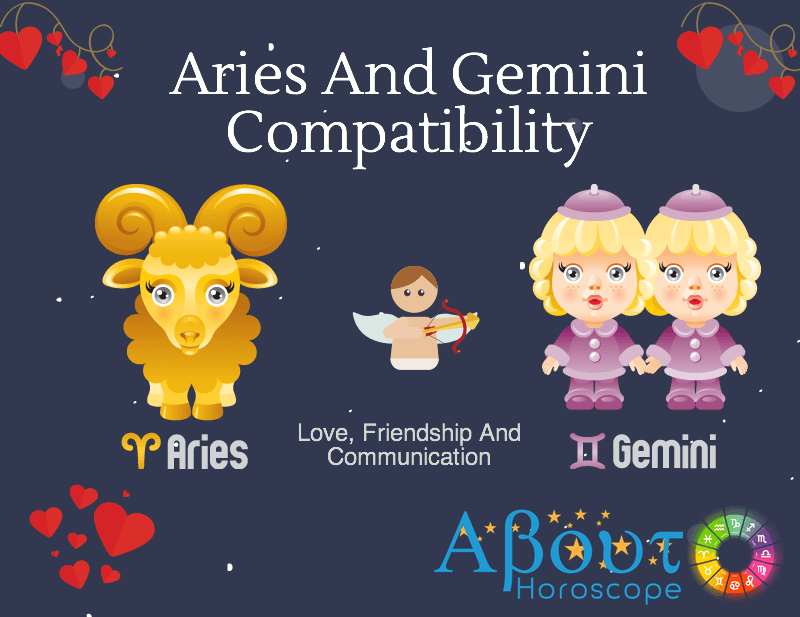 Aries and Gemini individuals have much in common and will encounter only a few glitches in love compatibility. Both of them love to enjoy life and are always on the lookout for adventure or new things. They create a good balance together. Aries wants to experience new things and Gemini wants to discuss them. There is no room for boredom in their lives. They easily let go of anything dull or sticky. They are not the clingy types. They live in the present and do not like to carry excess baggage from the past. An Aries will let a Gemini have his/her freedom and in return, the Gemini will respect his/her individuality and never lean on him/her too much. Even though the relationship of a Gemini and an Aries is quite smooth, there may encounter a few bumps on the way. One such situation is when Gemini takes much time in completing a conversation, which may make the Aries impatient and irritated. The zodiac match of an Aries and a Gemini is a lively one, in which there is no dearth of intellectual talks and articulate arguments. They brighten each other’s life and know how to live life to the fullest. Gemini will love the Ram’s enthusiasm and Aries would enjoy in the company of the Twins. Gemini natives are looking for partners that satisfy their need for intellectual stimulation, good conversation, and constant variety. They are best suited to matches with either their fellow air signs or complimentary fire signs. Aries is a Fire Sign and Gemini is an Air Sign. Air fuels Fire and makes it spread, making this a great combination. Gemini also helps Aries realize their full potential — Gemini definitely has the energy to keep up with Aries’s fast pace and wild ideas! The combination of true, driving passion and intellectual prowess makes just about anything possible for these two. Both Signs have wide-ranging interests, and the best part is, at the end of a long and active day, Aries can come home and tell chat-hungry Gemini all about it! Aries man and Gemini woman get on like a house on fire. Variety, excitement, new challenges and adventure are the words that get both of them going. This relationship has nil chances of boredom creeping in. Though they may have heated arguments every now and then, the fire will calm down as soon as it blazed. She will keep him on his toes all the time and he will be the perfect answer to her needs of constant communication. Together, they will explore, talk, love and have lots and lots of fun. They can form one of the most formidable couple pairs in the world. You can expect variety, fireworks, passion, arguments, and exchange of opinions, challenges and excitement with this pair. New challenges and goals will take them forward with renewed vigor. Fireworks may ensue with heated up arguments that may eventually die down after reconciliation. Gemini woman knows how to control her Arian spouse because of her excellent communication skills. The positive qualities of Aries are complete trust, fearlessness and innocence. But they also are very egoistic and aggressive in their actions. The Aries man frequently displays jealousy because of the fear of losing his lady love someday.For the relationship to last, the Gemini woman must learn to return the extreme devotion of Aries man with love and deal with his hidden insecurity. An Aries woman and a Gemini man can gel equally well. The relationship between them is dynamic and energetic one. The combination of an Aries woman and a Gemini man is a high energy one. Both of them share mutual interests and a Gemini man will never ever overshadow the individuality of an Aries woman. At the same time, she will shower him with attention and will be interested in his wildest of dreams. He will woo her with his charm and romantic gestures. They respect each other’s wisdom and intellectuality. Aries woman knows how to shower her love and affection on a Gemini man. An Aries woman is very charming and smart while a Gemini man is very intellectual and energetic. However, she may need to control her flirtatious nature and aggressive instinct and behavior so that no serious problems will arise in between them. An Aries woman in love with a Gemini man provides him with a partner who can go to any extent to defend and protect her man. She helps him in achieving success and fulfilling all his wishes with her strong courage. She gives herself away quickly, by holding nothing back and ensuring her Gemini prince of all the love and intimacy. However, his woman needs constant reassurance. To make the relationship actually work he has to be more considerate and she needs to leave her fears behind to fly freely with her cheery Gemini man. With this enthusiastic Aries-Gemini pairing, come some unavoidable challenges which they both have to face from time to time. They both react to each other very impulsively, and neither of them is given to setting goals for their relationship and takes the responsibility. The key here is to do things with each other, being careful not to ride too high on that burst of energy that can fizzle. If they are ready to slow down once in a while and enjoy each other, this relationship can be both invigorating and rich. What’s the best part of the Aries-Gemini relationship? Their ability to work together as a single unit. Together they can discover and learn much more than they would on their own.